Cesar Flores Negron serves San Diego Zoo Global as Scientific Director of Cocha Cashu Biological Station in Manu National Park, and General Administrator for San Diego Zoo Global-Peru. He is responsible for the management of the Biological Station and also serves as the executive director of our local office in Peru. His research focuses on silviculture, forest management and restoration, and forest effects on water quality and movement through the landscape. Currently, Cesar is working on consolidating a short and long-term research program that will bring together Peruvian scholars, international universities, and Institute staff to address important questions related to monitoring and managing protected areas and their buffer zones in southwestern Amazon. 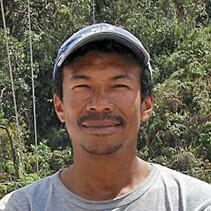 Cesar is a Peruvian forester who graduated from la Molina National Agrarian University. He earned his master’s degree in Forest Science from the Yale School of Forestry and Environmental Studies, and is currently working on the regeneration ecology of tropical lowland cedars for his doctoral degree. His interests range from plant establishment and ecophysiology to insect–plant interactions, tropical soils, and forest management for ecosystem services. Cesar is a proud of his experience in the Scouts, who pointed him to conservation and helping people. The motto from his alma mater, Agrum colere cupio (I want to work on the Man and on the Land), is a good descriptor of his passion.